I Might, I Would, I Will: Remembering Frost's "The Gift Outright"
As Yale University professor and poet Elizabeth Alexander prepares for the most important poetry reading of her life—on Tuesday, January 20, she'll read at the inauguration of now President-elect Barack Obama—it's worth taking a moment to reconsider what has become in most people's minds the gold-standard for inaugural poets: Robert Frost's recitation of "The Gift Outright" at John F. Kennedy's inauguration in 1961. There, blinded by the sun's glare off of the snow and baffled by high winds, the 86 year-old Frost had to give up on the poem he'd in fact prepared for the occasion ("Dedication") and recited from memory one that he'd written more than 20 years earlier. "The Gift Outright" is now so linked to 1961 that many people assume Frost wrote it for the inauguration itself. "The Gift Outright" had a pretty long and interesting history before 1961, however. It first appeared in the Spring 1942 issue of the Virginia Quarterly Review, although Frost claimed he had written it six or seven years earlier—smack dab in the middle of the Great Depression. As VQR notes in its history of "The Gift Outright," Frost soon thereafter revised the poem's last line for publication in The Witness Tree (1942), changing it from "Such as she was, such as she might become" to "Such as she was, such as she would become." Indeed, this is the version (pictured to the left) that the Library of Congress presents as the 1961 inaugural manuscript, even though this manuscript version contains a note in the upper right-hand corner that reads "Three War Poems II" and is identified in the bottom left as being from The Witness Tree in 1942. Clearly—as will become even more evident in a moment—this handwritten manuscript is a version of the poem Frost read in 1961, but it's not the actual poem he recited. 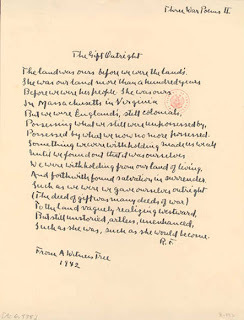 In addition to using "The Gift Outright" in The Witness Tree (which won him his fourth Pulitzer Prize, in 1943), Frost also used the poem on his Christmas card for 1942 (pictured here). Late in 2008, "Poetry & Popular Culture" showcased some of the Christmas cards which Frost produced in collaboration with Spiral Press printer Joseph Blumenthal. What's particularly interesting to "Poetry & Popular Culture" at the present moment, however, is how Frost—sending his holiday wishes a year after the attack on Pearl Harbor—politicizes the Christmas holiday by greeting friends with one of his "war poems." For a poet whom many people assume to be pretty darned unpolitical, this is a pretty political move. So the history of "The Gift Outright" was a fairly complex and political one before 1961 even rolled around—a history in which Frost repeatedly situated the poem in relation to the world he was living in and even changed its wording to serve as a sort of barometer for how he was currently feeling about the U.S. VQR in fact points this out, arguing that "The substitution of 'would' for 'might' makes the poem more optimistic, more assured of America’s future glory. The version published in VQR seems to reflect a deep and perhaps healthy uncertainty about the nation’s future trajectory." It makes sense that, writing in the middle of the Depression, Frost would articulate his sense of the nation's future in less certain terms than he would on the eve of World War II when calls for patriotism demanded stronger language on all fronts, poetic fronts included. If Edna St. Vincent Millay could be convinced into writing a book-length propaganda poem (The Murder of Lidice) at the bequest of the Writer's War Board, then certainly Frost could be moved to change a verb from "might" to "would." What VQR's history of "The Gift Outright" doesn't tell, however, is that Frost would go on and change the poem and its final verb another time, just as the poem's political stakes were at an all-time high. If the Kennedy Museum's transcript is in fact correct—and it is only partly so, as my postscript to this entry explains—it reveals that in 1961 Frost ended with the line "Such as she was, such as she will become." If VQR's argument about the significance of the verb changes holds water, then what are we to make of this move—from "might" to "would" to "will"? If the shift from conditional Depression-Era "might" to definitive Wartime "would" reflects Frost's changing levels of optimism, then how are we to interpret the postponement of American success implied in the shift to the future tense "will become" used at Kennedy's inauguration? Was the 86 year-old Frost tapping into and reinforcing the forward-looking and progressive rhetoric of the 35th and youngest American President? Or was Frost audaciously tempering his enthusiasm for the nation and qualifying his Cold War endorsement of Kennedy by shifting tenses from "would" to "will"? In the way of a conclusion to this history, it's interesting to sit and listen to In Their Own Voices: A Century of Recorded Poetry—a four-CD anthology of 79 poets reading their poems aloud—which includes what sounds like Frost's recitation of "The Gift Outright" in 1961. Rather than play up the most poetically ambivalent moment of "The Gift Outright," its final line, the recording tapers off at this exact moment and blends into Robert Graves beginning "To Juan at the Winter Solstice" so that the listener can barely hear in the overlap of the two voices whether Frost is in fact saying "might" or "would" or "will" (though I believe it's "will"). Many people prize these sorts of recordings for the sense of authenticity they seem to add to poems; hearing a poet read in his or her own voice (as the anthology's title suggests) supposedly restores something that the poem otherwise lacks. "Poetry & Popular Culture" isn't going to agree or disagree with that assessment (not now anyway), so much as it wants to stress that even the recording of poets reading their work is an act of literary interpretation. Here, the sound people of In Their Own Voices actually obscure what might in fact be the most interesting verb-iage in "The Gift Outright." Presenting itself as documentary evidence, the recording nonetheless erases the most contentious—and perhaps the most political—part of Frost's poem. All of this history, of course, was made possible by the serendipitously bad weather which forced Frost off script in 1961 and burned the poem he wrote in the 1930s into the popular imagination. 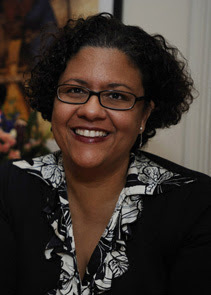 Let's hope—as the temperatures in Iowa City threaten to plunge to -15 tonight—that Elizabeth Alexander might have similar luck when she reads this year. Postscript: The history of "The Gift Outright" and its final line grows ever more complex the more one listens and looks. As the actual transcript of Frost's reading reveals, Frost did end the 1961 inaugural poem with "will become" but worked his way up to that ending by first sifting through a number of other verb tenses: was, would, and hath. As Frost notes, he uses the future tense "will become" expressly "for this occasion"—a reminder from one of our most "timeless" poets that not only are all poems occasional poems, but that occasional poems (not to mention their recordings and transcriptions) are political poems as well.